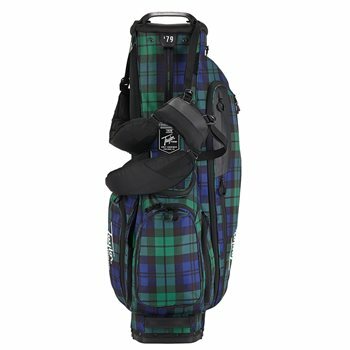 The TaylorMade FlexTech Lifestyle stand bag features a 5-way top with full length dividers that provide club protection. The bag is lightweight at 4.9 pounds and features a FlexTech stand system with a smooth release, collapsible base. The dual density carry strap provides comfort and stability and the 11 pockets provide ample room for carrying personal items and accessories. Featured pockets include an insulated water bottle pocket and a water resistant valuables pocket with micro-suede lining for weather and scratch protection.